The popular Radio 2 writing competition for children launched today, with Chris Evans heading up the team of judges again. 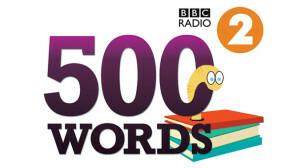 500 WORDS invites children aged 13 and under to submit their short stories of fiction to be judged by a panel of authors and celebrities including Dame Jacqueline Wilson, Richard Hammond and Charlie Higson. Launched in 2011, the competition has been extremely well received. Last year’s competition attracted over 74,000 entries, with famous people such as Justin Bieber, Prince William, Wayne Rooney, and Radio 2’s own Chris Evans making repeated appearances in the stories, alongside made-up mythical creatures like the sharkbaragator (part shark, part bear and part alligator) and chocolateosaurus. And for the second consecutive year, the millions of words used by the young writers will be analysed by Oxford University Press to help shine a light on children’s use of language today. The writers of the top 50 stories will be invited to attend a broadcast of The Chris Evans Breakfast Show that will be broadcast live from the Hay Festival on Friday 31 May, 2013. The six lucky winners will be announced live on air and will get to hear their stories read out by a famous narrator. A shortlist of 50 favourite stories will be picked from across two age groups – under 9s and 10-13s. The 2013 competition will run until Friday 22 February. Details about how to enter are available on the 500 WORDS website.